When a dear friend finally completed his treatments and recovered from the side effects, I mentioned he could proudly wear a ribbon as a cancer survivor. He told me flat out that a ribbon just didn't cut it for him. The year fighting “the big C” had been tough and he wanted something to commemorate his journey back to good health that was tougher than a ribbon. 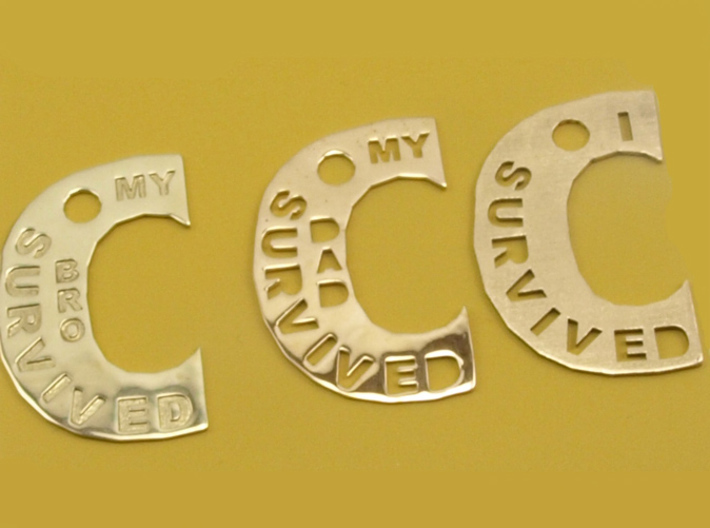 The I SURVIVED the Big C (and the MY MOM/DAD/SIS/BRO/FRIEND SURVIVED the Big C ) pendants you see in my Shapeways shop are the results of that conversation. They are simple mementos to note the tough fought battles personally won against cancer. 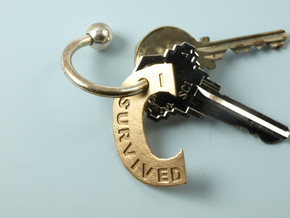 Originally, the first was made as a key fob, but they can also be worn as a pendant, or, using a tie tack, as a pin. They are printed either as engraved or with the letters cut-through. 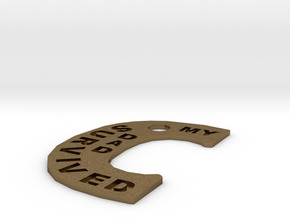 (I think the cut-through versions tend to be more easily read when worn as a pin.) *********************************************************************************************************************** Five percent of the purchase price (not including shipping) of this item will be donated to the American Cancer Society. 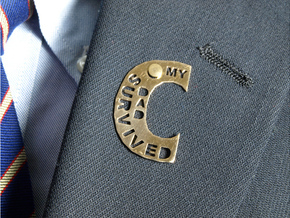 *********************************************************************************************************************** If you wish to wear the I SURVIVED the Big C as a pin you can personalize the C by attaching it with a souvenir pin which has a special meaning for you or your loved one. Otherwise a simple tie tack post and clutch will do. The hole in the C is about 4.5mm in diameter and a tie tack with a 5mm pad will work fine. PLEASE NOTE: The MY FRIEND SURVIVED the Big C is about 1/8" bigger than the other SURVIVED the Big C items, however, the hole is still about 4.5mm in diameter.